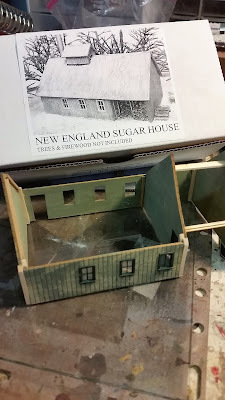 Based on a "real" Sugar House in Vermont, nice little kit. I used a real green stain I had left over. I changed around the roof a bit, to make look like it was added on to, I couldn't stand the seam in the roof line. 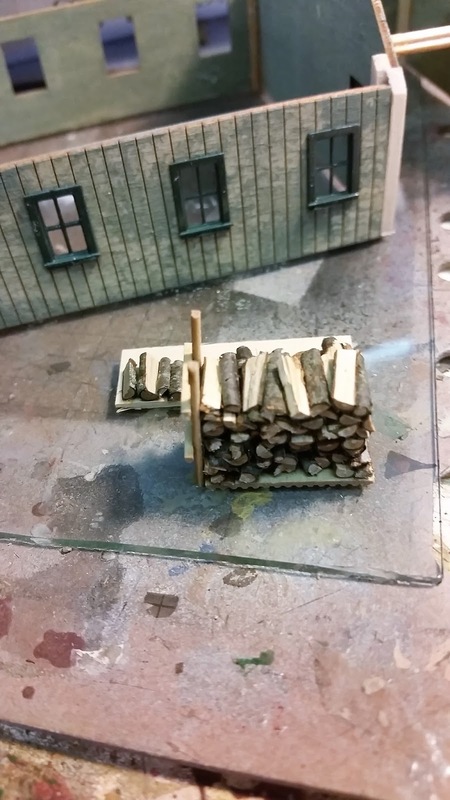 Chopped a few chords of wood. 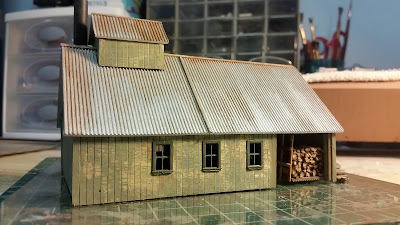 Added a few details, needs to add windows and place on the layout. 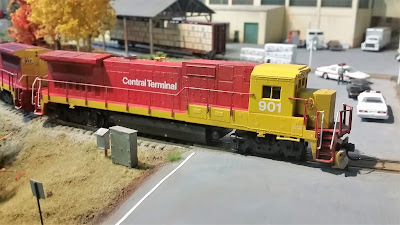 Dug out my old Central Terminal B-40-8's from old Walthers stock years ago. 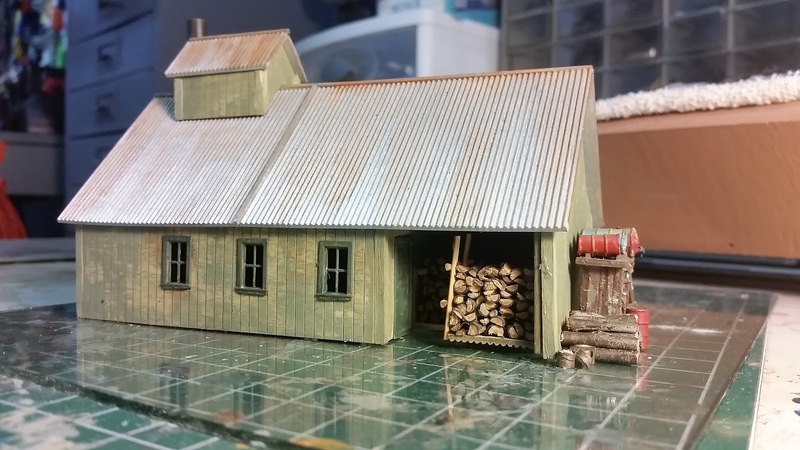 They still look nice, lack of detail, these are not DCC. 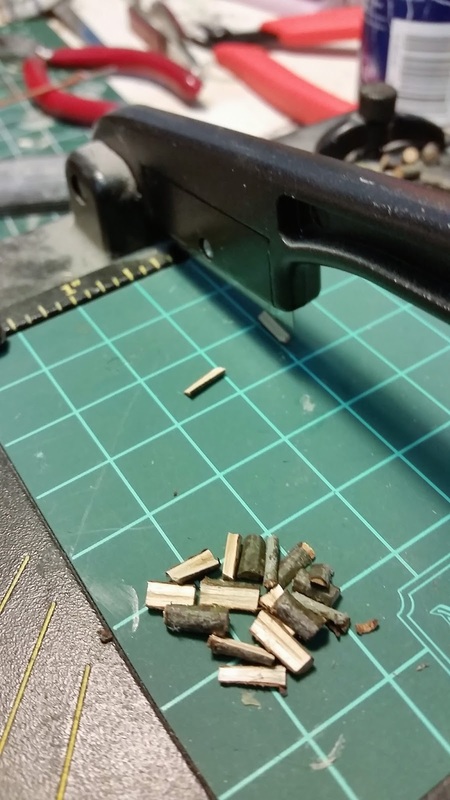 After Springfield I put decoders in my Atlas CP 424's, no sound yet! Latest D&H Video: PYRP at Cammeron’s Crossing 1981. With another winter snowstorm departing the region yesterday, I decided it would be a great night to stay local and shoot the NECR! Conveniently ignoring the obvious fact, that with six to fifteen new inches of fresh snow access to my favorite locations would involve more than strolling around with the lights. My intention was to shoot train 324 on its southward journey behind a solid set of G&W painted units. Leaving Hinesburg at midnight it was instantly a challenge getting down to the interstate, but once on I89 one lane was in decent shape for forty five to fifty mph. My plan was to go to S. Royalton, but with the roads off the interstate so poor and 324 so late I changed my mind and went to the Red House in Northfield. I slogged around in snow over my knees looking things over before deciding I did not have enough time to set up before 324 would appear. Back up the hill slowly to the interstate then south. 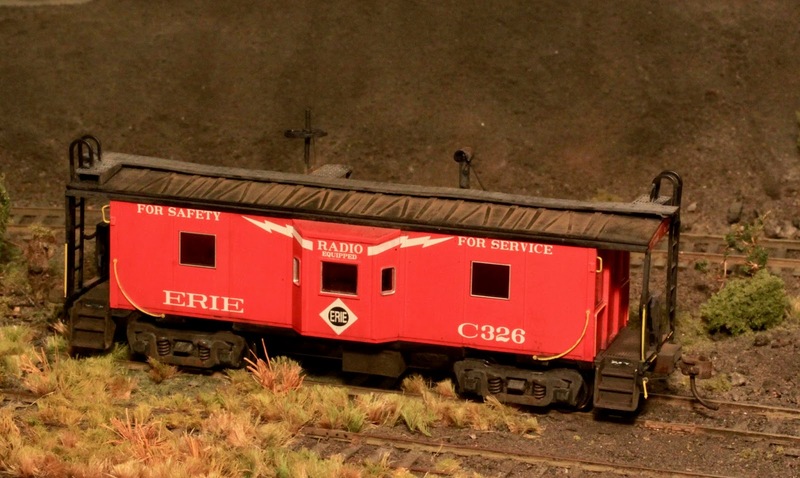 The NECR dispatcher comes on the air, informing 324 they will meet two trains tonight. Amtrak and 323! Amtrak's Vermonter is broke down at MP 30, south of South Royalton, with 323 well behind it. The Genesis engines have died, sat down and refused to move. I reflect how the engineer probably flogged them too hard coming out of White River, LOL! A spare NECR crew has been called out of White River Jct. to take train 600s power to rescue Amtrak. The plan is to run light engine up to, then push Amtrak up to the passing siding at S. Royalton, then run around The Vermonter using the siding and back down to couple on before “highballing” to St. Albans! 324 is set up to meet both trains at Randolph. I head there too! I remember train 600 uses one or two four axle engines as a rule and decide to see how my luck is tonight? And plan on shooting Amtrak and 323 in Randolph. The power for 600 “could be” set up long hood forward............(boo, hiss) and it might not be painted in the G&W colors either. I decide to take my chances. The Randolph cop who is in his last hour of his night shift is sitting in the SUV in front of the police station. A vehicle appears up the street, and Gary drives by arriving in the civic! There is no place to park. High snowbanks where parking areas once existed. I try different approaches to the area I park in by the police station, all of which fail. There is no room! The cop watching me from his SUV. Finally I park parallel to the road beside him, get out and ask if I can park there. He says “no”! I think...........well, that’s pretty clear, lol! I ask about three other spots I can see, all of which get a “NO!” Then he explains how they will be plowing soon, and I explain what I am up to. He looks at me and says.......”So you’re the guy! I’ve heard about you. It’s nice to finally meet you!” We discuss wether the railroad is actually running trains tonight or not, he is aware of Amtrak stopped on the main, I contribute yes, that is the train I am here for! Then I ask where I can park and he points up and across the street to the bank parking lot. He agrees to allow me to unload equipment here before moving the car. I love stuff like this at night! Unexpected obstacles more often than not point to a great night photo opportunity beyond them. 324, with permission to the north switch comes into town as I unload equipment. They get clearance to go further south to Bethel where they will meet Amtrak followed by 323. I watch and wave as they pass by then go park the car, walk back over, realize I forgot my mark in the car, walk back to the car to get it, then return. Ok I think......lets do this! I climb over a snowbank and up to track level with the lights and stepladder, the snow is deep but powder! 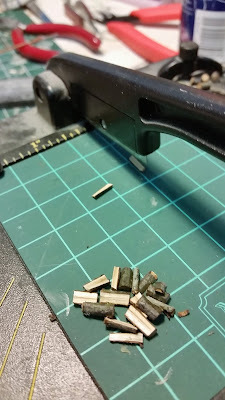 I have a good idea where everything goes and in maybe forty five minutes I am set up after tiptoeing carefully around in my footsteps, not wanting to fall and make a crater, knowing I can erase them later in photoshop. All the time Mother Nature has been contributing a steady snowfall with temps in the upper teens/low twenties. Really ideal conditions! But...........will it be like this at train time? The dispatcher comes in loud & clear here on my hand held radio and eventually I hear Amtrak given permission from the north siding switch Bethel to St. Albans. No engine number mentioned. Jeez, I am hoping they are not running long hood forward! 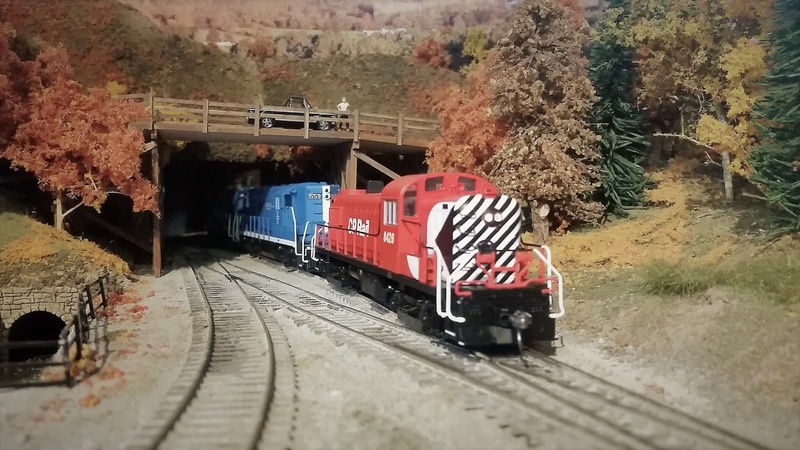 I’m visualizing a GP 38/GP 40 here leading Amtrak Genesis engines. The snow keeps falling! Minutes tick by as I nervously keep looking over at streetlights to reassure myself it’s still snowing. Finally I hear the NECR engineer loud & clear call on approach to Randolph, then back to the Amtrak conductor to spot him at Randolph! They are close! And they are making the normal stop here? I’m amazed! The passengers are still onboard?! The Vermonter is over nine hours late normally due here at 18:52. I was expecting a runby. I don’t hear an air horn until they have activated the crossing signals below my location. Maybe the air horn is plugged with snow? Up past the station comes the Amtrak Rescue, headlights obscuring number boards as the conductor calls out car lengths before the stop. I see cab facing me and 3317 at the same moment......Holy cow! It’s the Tunnel Motor! Slowly the head end drifts up towards me, passes my mark, I wait a second and press the shutter. Orange, black, white and silver reflect back as the cab comes to a stop directly beside and above me. I give the conductor a thumbs up, he is busy, ignores me and that’s fine, lol! Within a minute Amtrak is on the move, and I shoot the two Genesis engines (well known for not liking winter) going past with five cars trailing. 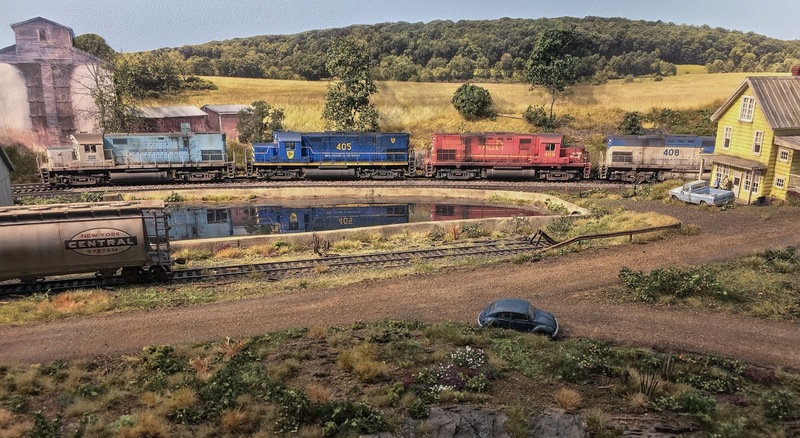 Two engines.......five cars? AND.......Mother Nature came through again for me as well! It was still snowing! The snowflakes in the black sky add a lot to the feel of the photo! Special thanks to Ed Ferguson! Shot in Randolph, Vermont on February 8, 2018 at 04:19. 1/800 @f2.8. Please enjoy! Comments are welcomed. Restored Erie caboose and, as such, lacks some of the original detail. This is something you likely have little interest in and less use for but, I'm finally filling another gap in my desires for completion of a dream. 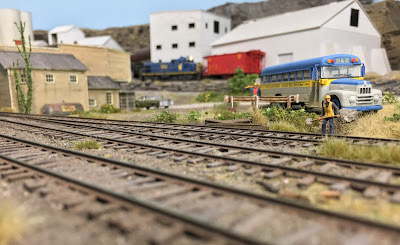 Since the ERIE did run down into the Wyoming Valley I thought they should have a small presence in one of my layout scenarios. 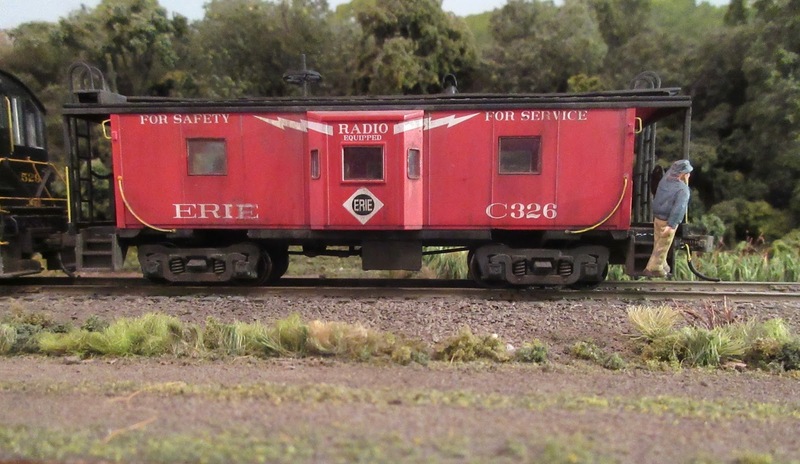 To accomplish that thought I acquired an ERIE (Bachmann sound equipped) ALCO S2/4 a few years ago. 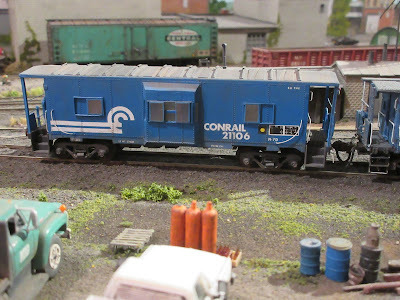 Now I've added a caboose to accompany it (Also Bachmann). 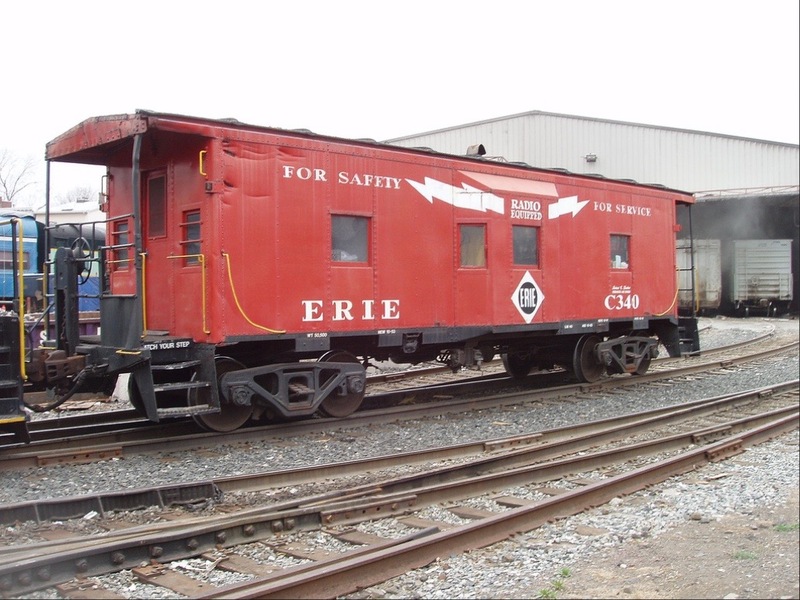 Many years ago I built a couple of the ERIE/EL cabooses, as acquired by Conrail (shown) and the D&H. 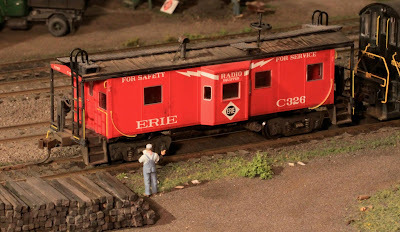 These were substantially reworked and detailed Athearn's. I wasn't interested in repeating that effort again so jumped on the Bachmann version that looked pretty good and was already painted and lettered. Well, it turned out to need quite a bit of reworking anyway! Most of the work was to the roof and underframe. I switched the smoke stack to the opposite side and added the radio antenna and walk extension to the roof. 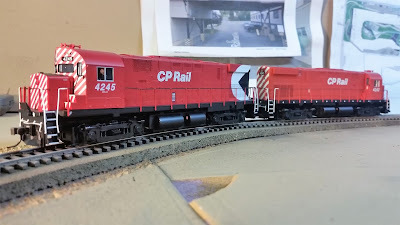 I had to replace the trucks with Athearn express reefer trucks and move the bolsters in 1/8" so they wouldn't hit the steps on curves. 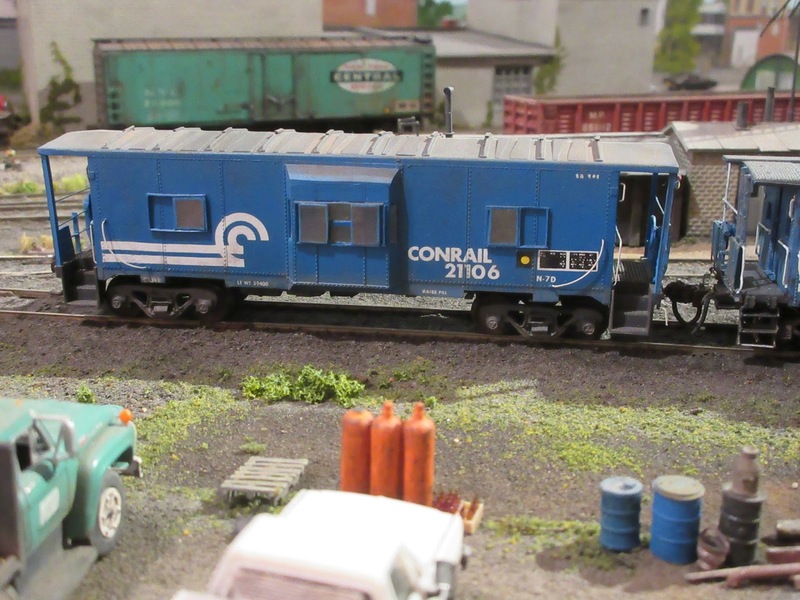 With a rebuilt battery box and a Cal-Scale generator added the heavy work was finished. After that it was just super details, and weathering! 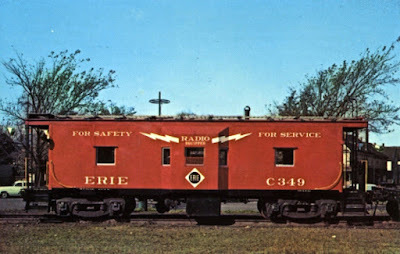 The more I thought and looked at the caboose - the more I realized it shouldn't represent 1952 when it was near new. I don't think that series would have been used for the runs to Ashley until later in their careers. I've since added weathering to represent as it may have appeared in 1960. Note also the addition of the brakeman. True to a prototype photo in my collection! 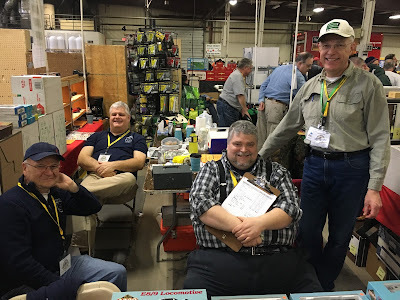 So Springfield was extra special this year as I was able to get my D&H bus from Blair in addition to the Other usual types of goodies I threw in my bag. Blair Davies asked me to take some photos of it, so this morning I got inspired and did some new scenery as well, near the interchange yard. Sorry I missed some of you guys at the show but it was great to see you those I did. 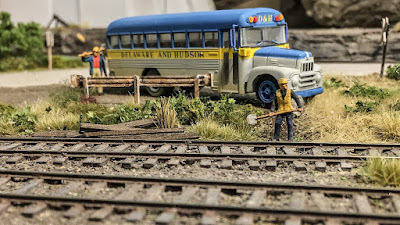 In this first photo you will notice both the bus that Blair did and the beautiful building on the left which was done for me a while back by Rick. Funny how you just need the right accent like Blair’s beautiful work, to really make things Pop! and this is my first new video done with it, as opposed to my I-Phone. sort of place that always feels good to me. Firstly, thank you to Bill Lipfert for the hot tip about this photo opportunity. We are looking southward at Ely, (the “Y” is pronounced as the Y in really, per the Vermont State Trooper who “interviewed” me later in the night further south, I thought we could take his word for it....... ) Vermont as Vermont Rail Systems (VRS) “Polar Express” train set behind GP 40-2 308 slows to a stop. LDK Engineering Services out of White River Jct. 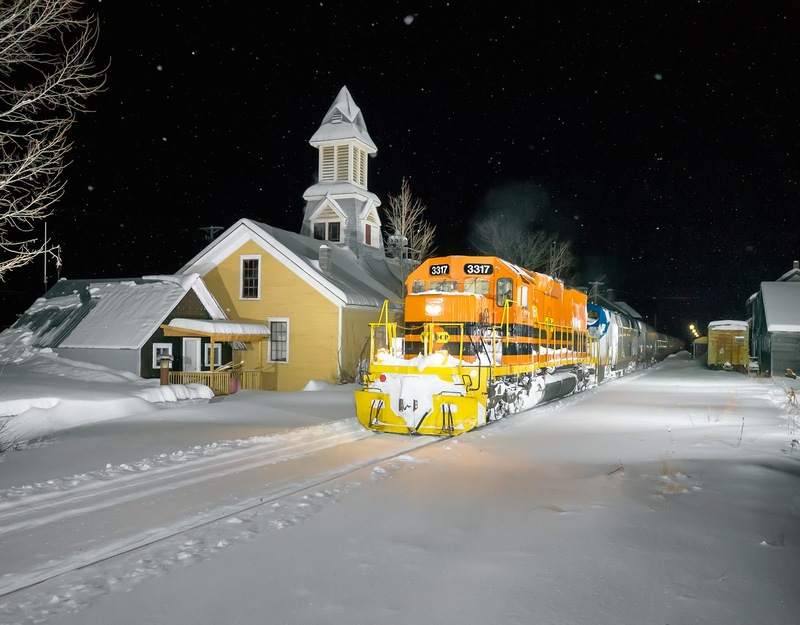 has chartered the train set for the company Christmas Party this year, to make a round trip between White River Jct. and Ely! Bill, who is on my mailing list, asked me if LDK could hire me to take a photo of the train for the company to make a print from to display on a wall? I said SURE! I will require only gas money as the chance to shoot a northbound here is very rare, and if LDK Engineering wants to charter the train, I will be more than happy to take a photo for ‘em! Tracks were first laid here in 1848 when Boston & Maine (B&M) predecessor Connecticut & Passumpsic Rivers Railroad arrived. The classic B&M station with family living quarters on the second floor was built around 1900, I have included a photo showcasing the building. It is lived in at present. For many decades the B&M and Canadian Pacific (CP) operated this line jointly. 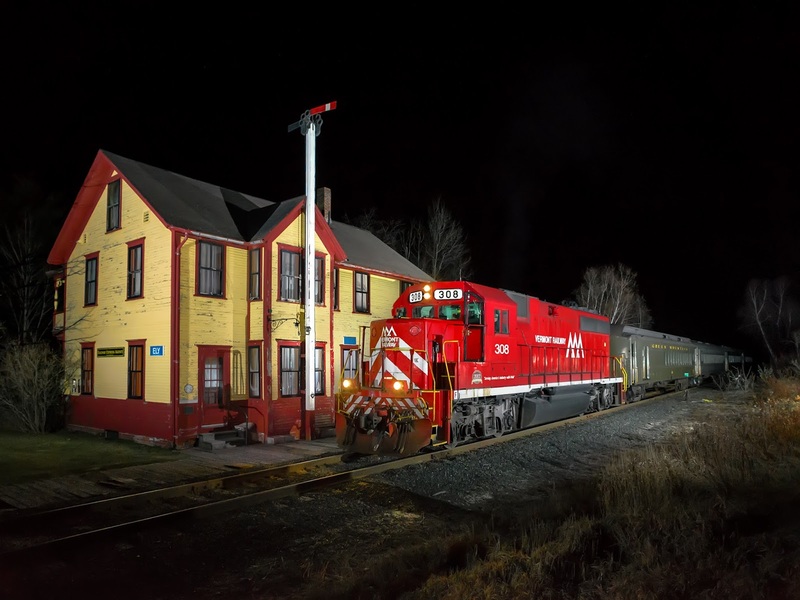 Providing the B&M with access to Montreal and Quebec and CP access to New England and the East Coast. Legendary railroad photographer Phillip Hastings grew up and took his first photos ten miles north of Ely at Bradford. 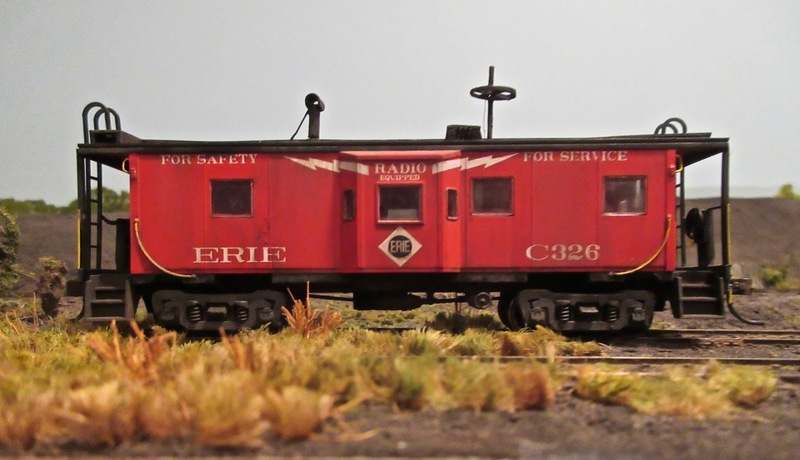 Today it is The Connecticut River Division of VRS’ Washington County Railroad (WACR), a (daytime) photographers delight running past farms and through villages while keeping close by the west bank of the Connecticut and Passumpsic Rivers with a short wayfreight in each direction weekdays. While it is not uncommon to shoot southbounds at Ely after dark this time of year, it IS rare for me to have a northbound to shoot as the crews terminal is only some twenty five miles away to the south in White River Jct. I arrived after the two hr. drive from Hinesburg but not before checking out a location at nearby N. Thetford which had a (gasp!) lit christmas tree trackside! Finally I thought..........I’ve discovered the elusive VRS christmas tree! But it would have been a tight shot with the train and I moved on to Ely. Pulling in, I jump out into silence, the occasional car on rte. 5 the only disturbance, and take a look, the view I wanted was too close for the GRs normal 28mm view............I returned to the car for the snap-on 21mm wide angle lens and that looks gorgeous! Lets light this up I think. So I park and get to work setting up the lighting. I’m about half way done when I hear an air horn..........to the south, I stop and weakly contemplate...........is that MY train? LOL! Of course Gary! Well I think, it IS silent so they are a good ways away and...........I don’t have to worry about over lighting the scene, I won’t have time to! LOL! 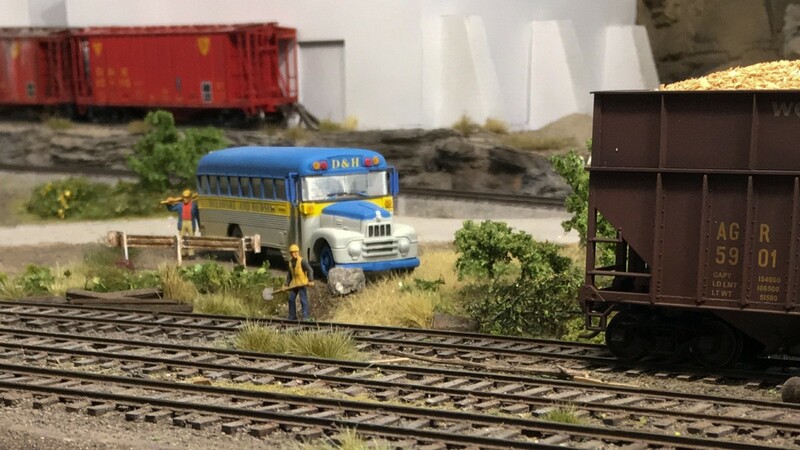 The lighting set up flows smoothly and I have eight of ten flash units set up when I take the shot of the station with 308s headlights in the distance. I have a street with grade crossing at my back, so the crossing signals guide me where I place the stepladder. These “one and done” setups work the best much of the time at night, too much thinking can get me in trouble. For example here, I spot a flash just beyond a telephone pole to my right, aware it will throw a shadow onto the scene and make sure to eyeball where the nose of the 308 is planned for so the flash will cover part of it. Back atop the stepladder the test shots show the shadow from the telephone pole forming a frame with the white semaphore mast for the 308! If I TRIED to do that, I would be going back and forth, back and forth. Here they come slowly drifting up to the station, I’ve fired off the lighting for the crews awareness although they know I will be here, and 308 almost comes to a stop short of my mark, then the engineer notches the GP 40-2 out a bit and it pulls ahead. Oh my gosh what a sight! My mark blinks out, the lighting reflects back the red & white from 308 and the yellow of the station! Success appears on the rear monitor of the GR! One shot makes the night again! Yes, get paid to do this? No way! It is too much fun! I’m happy getting my gas paid for. Shot at Ely, Vermont on December 7, 2017 at 19:08, 1/500 @f3.2. Special thanks to Bill Lipfert and LDK Engineering! Please enjoy! Comments are welcomed.